A massive wildfire plume over Washington state, as photographed through an aircraft window by Arthur Sedlacek. It’s a hot day in central Washington as a twin turboprop plane cruises southward. Through the cabin window, the jagged peaks of the Cascades rise in the west; to the east, a lush carpet of green vineyards and yellow wheat fields. But an hour into this flight, the blue skies give way to a white haze that rapidly turns to an alarming burnt orange. The cabin begins to reek of smoke. The plane’s vibrations increase until the entire vessel is rocking and rolling. For a few seconds, the plane is literally free falling. All the while, outside the window, the sky grows darker and darker. It’s another day at work for Arthur Sedlacek, an atmospheric chemist who is trying to solve one of the biggest mysteries in global climate change: the role that wildfires play when they spew millions of tons of soot skyward each year. 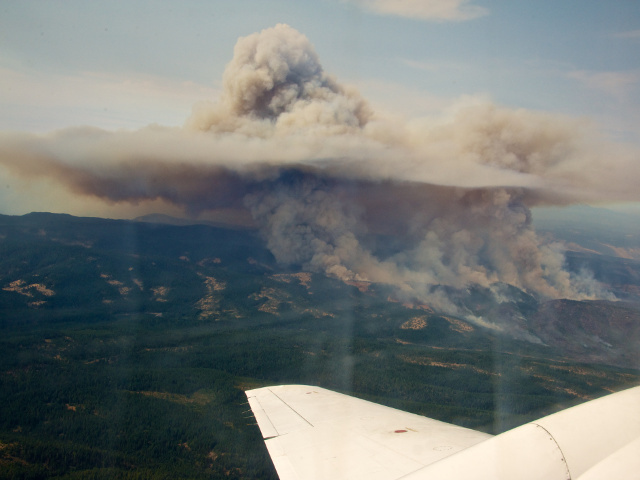 For five months in 2013, Sedlacek was part of a thrill-seeking team that flew into wildfire plumes in the Pacific Northwest and then Tennessee to measure exactly what’s in the soot. “Biomass burns are just this incredibly rich soup of raw material,” said Sedlacek, who is based at Brookhaven National Laboratory in New York. As the threat of global warming becomes increasingly pronounced, accurate measurements and correct predictive models are more essential than ever. But there’s a major problem: When researchers incorporate the effects of greenhouse gases into their models, the outcome is an extremely hot Earth — too hot, explains Sedlacek. There must be some missing factor that cools the earth ever so slightly, but scientists haven’t figured out what it is. Sedlacek’s team thinks the likely culprit is aerosols, which can be anything from sea spray drops over the ocean to small, industrially produced particles in a city. One of the biggest and least understood sources of aerosols is wildfire, which generates 40 percent of the carbon soot (also known as black carbon) in the atmosphere. It’s a tricky scientific problem because fires exert both warming and cooling effects on the climate. Black smoke billowing up from a fire’s center has a warming effect because dark aerosols absorb light, keeping that energy trapped in our atmosphere. But as winds push aerosols away from the fire, the particles gather a reflective coating of organic matter, which has a cooling effect. White aerosols scatter light, sending that energy back into space. Things get even more complicated because aerosols affect cloud formation, and clouds can have either cooling or warming effects depending on their shape and location. Low-level clouds over the ocean, for instance, enhance the reflectivity of the Earth’s surface. They send incoming solar energy back into space, thereby cooling the planet. “Every cloud drop forms around an aerosol particle,” explained atmospheric physicist Ernie Lewis, another Brookhaven scientist involved in the 2013 flights, which are collectively known as the Biomass Burn Observation Project. So the smoke from wildfires can impact the climate directly, by reflecting and absorbing sunlight, and also indirectly, by influencing the formation of clouds. But how will these effects change as the frequency of wildfires increases in a warmer, drier world? “That’s the million-dollar question,” Lewis said. To try to answer that question as precisely as possible, Sedlacek, Lewis and their colleagues sampled 17 wildfires, seven urban plumes, and more than three dozen agricultural burns during 120 hours of flight time in 2013. Their research project is funded by the U.S. Department of Energy. During their fieldwork the team would wait for a wildfire to hit nearby and start planning for a flight 24 hours in advance. Then, three hours before the flight, scientists turned on the onboard suite of instruments, designed to measure the size and chemical composition of the particles as well as the amount of light they absorb or scatter. Complicating the task, flight restrictions limit how close the researchers can get to the fire, ensuring they stay out of the way of the smokejumpers fighting the blaze. So the pilots need to stay in constant communication with the firefighters in the area. As soon as the aircraft safely landed, Sedlacek pulled the pilot aside to ask why he was so worried about the engine. The pilot explained that aircraft engines need oxygen to burn fuel, and there’s very little oxygen in a smoke plume. Now that the fieldwork has ended and the researchers have their feet firmly on the ground, they’re starting to sift through the data. Already, they can say with some certainty that the wildfire aerosols have an overall cooling effect, which should help explain the shortcomings of many climate models. The finding doesn’t surprise Larry Berg, an aerosol expert from the Pacific Northwest National Laboratory. It’s “consistent with particles becoming more reflective as they age,” he said. He’s excited to see how the models will react with the additional information. Today, Sedlacek recalls the twin turboprop as “the little engine that could,” with a tone that seems to suggest it won’t be long before he takes to the skies again. Shannon Hall is hooked on three things: the smell of freshly ground coffee beans, the feeling of enthrallment while traveling solo, and the wonders of the Universe. She earned her B.A. from Whitman College in physics-astronomy and philosophy and her M.S. from the University of Wyoming in astronomy. She’s currently a freelance science journalist and will continue to share the stories strung throughout the Universe.